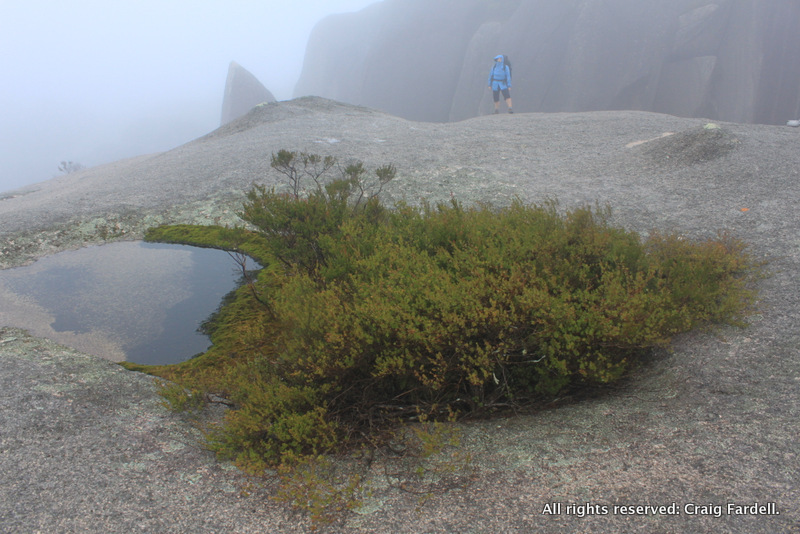 South Bald Rock, in Girraween National Park, in mist and low cloud, traps you in the immediate landscape; brings you close to shapes, patterns, colours. To be less sentimental about this, its a bit like airbrushing the scenery; gives it that soft, ageless, wrinkle free look. 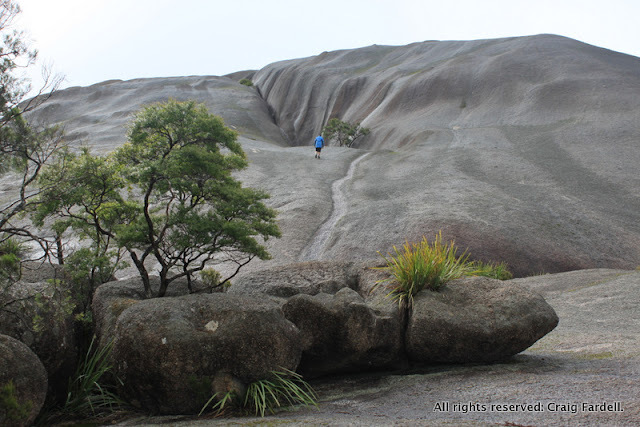 We set off for this weekend walk from the car park in Bald Rock National Park and headed west and then south along well defined trails and into neighbouring Girraween National Park. We could barely see more than 100m ahead of us. 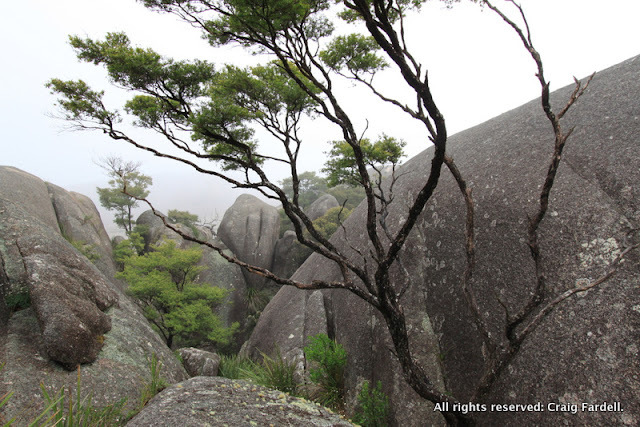 The promised big vistas that these two parks offer, across granite peaks and rough bush, were completely obscured. At a couple of points where the track opened out and promised amazing views, we got a whiteout. To be honest, I admit to feeling disappointed. 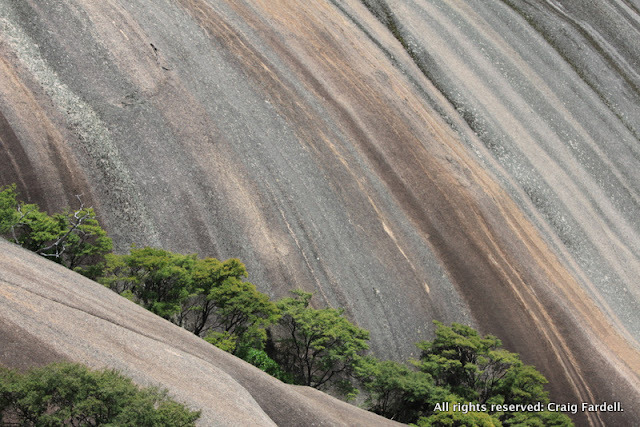 These two national parks, sitting side by side along the Qld/NSW border, are renowned for their spectacular and towering bare rock outcrops. We had travelled a long way, a 6 hour drive for a weekend walk, and I felt we were missing out on the important stuff - the views across to The Pyramids, Castle Rock, Mt Norman, Sphinx and Turtle Rock, Bald Rock and all the unnamed granite shapes and mountains between. Still, one look at Cas' photos from this trip and the beautiful landscape they captured it is obvious that it was my mood that was all wrong, not natures. It stands as a good lesson in expectations - to not have them in the first place. I could appreciate the beauty of the bush around me, no doubt: the barks and mosses rich in colour from the light rain and dampness of misty air. But my appreciation was tempered by that fact that having suffered yet another wet summer and autumn I had travelled north to Girraween in the hope of sunshine and wide horizons. By the time we walked out to South Bald Rock, late afternoon, it had at least stopped raining heavily. 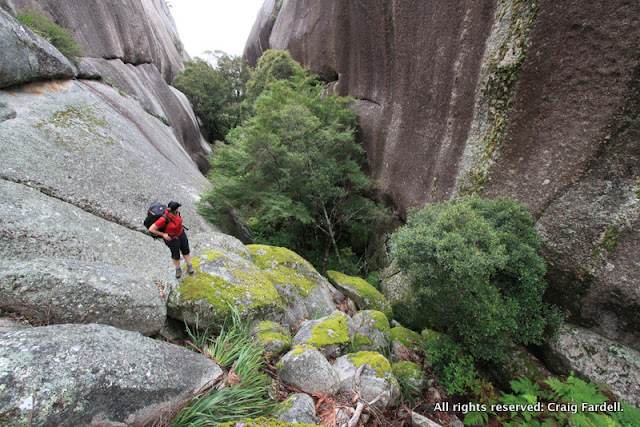 We found ourselves a quiet little alley to set up camp (see 2012 Campsites blog) and spent the afternoon exploring nearby nooks and crannies, scaring up a feral mountain goat hidden in the rocky folds of the landscape. 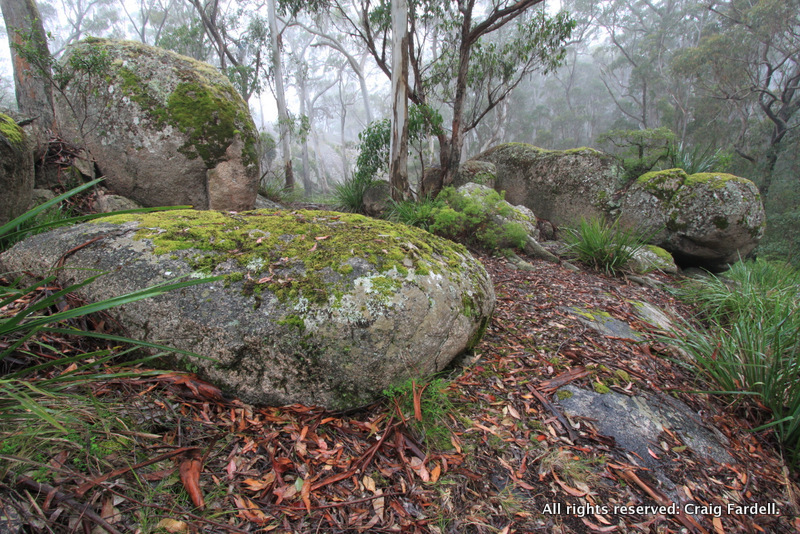 By the next morning the rain had ceased but the low cloud seemed to have dropped lower. A bitter wind whipped across the top of the rocks. 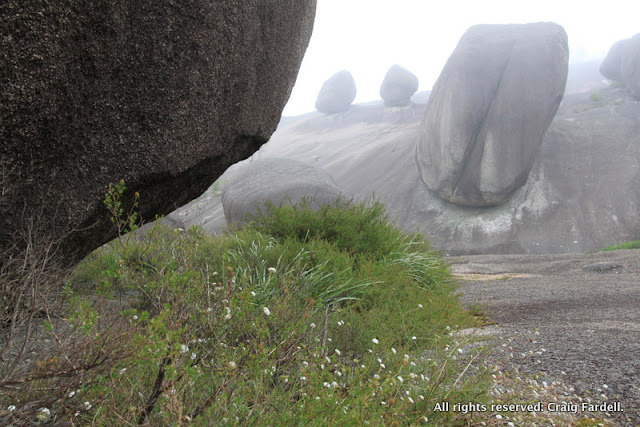 Yet my mood lifted as the landscape became increasingly, and intensely, dramatic. Above our campsite, still pools of water in the granite were surrounded by rich moss and we fumbled through the thickening cloud toward the high point of South Bald Rock. 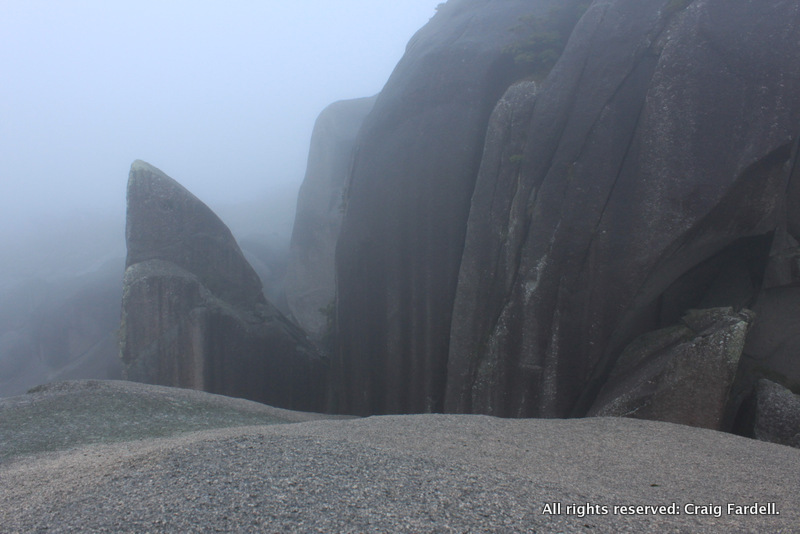 All morning we explored granite alleys and clambered over the front of South Bald Rock as slowly but slowly the wind whipped the cloud back into the sky. Before long, glimpses of distant peaks were possible. The cloud lifted some more. Patches of sunlight filtered through. Finally, the last of the low cloud blew to the north and the entire, huge view across the two parks opened up. 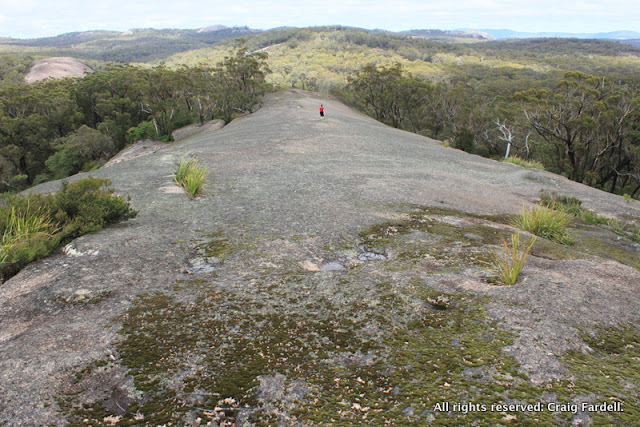 We scampered to the top of South Bald Rock one more time just to see what we had missed. Clear views lingered for the rest of the day - all that we had missed on the walk in, we got on the walk back out as we retracted our steps to the car. 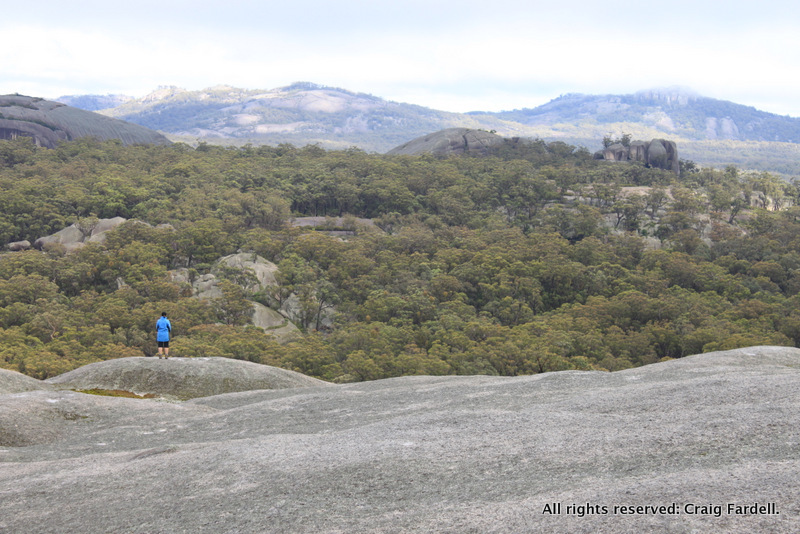 The clear weather gave us good reason to explore Little Bald Rock on the way back and at the end of the day we cut off some track walking time by taking a short bush bash detour up the back of Bald Rock. From the summit, what opened out before us was acres and acres of opportunity. 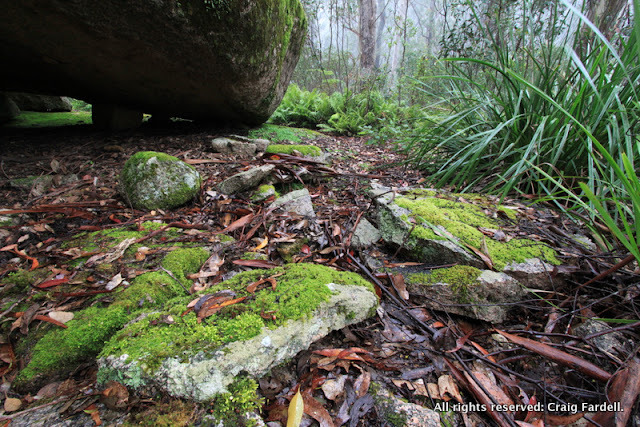 The options for walking and exploring in these two national parks seemed endless and, should the mood take us, we will be back to do just that - rain, hail and shine. Everything about this post is wonderful. I love it. Thanks for your nice comments! We just checked out the "cabins mt carmel" link you left beneath the comment - it looks like you have a pretty special place as well.